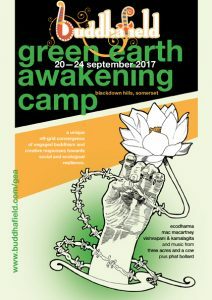 The poster-flyer for the 2016 Green Earth Awakening Camp was met with consistent popular approval. I agreed with the organising team that developing a successful, graphic theme of Buddhist protest was the way forward. The approach I took marks a synthesis between the 2016 and 2015 GEA projects. I’ve taken the strongest elements of the 2016 poster and softened it somewhat with subtler line drawing, slightly extended colour pallet, and the inclusion of a Buddhafield masthead. The direction further explores late 60s and early 70s psychedelia, which in turn references Art Nouveau. However I’ve contrasted this with a fairly strict typographic grid, such that overall piece has solidity and directness. 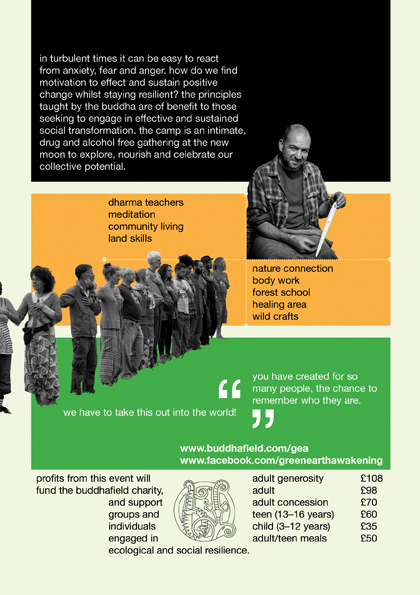 As with the 2016 poster, the hand is based on that of the popular Tantric Buddhist deity Green Tara, her traditionally raised left hand delicately holding and transforming the barbed wire of oppression. Clearly in this case the hand is male (actually, mine! ), where the green has been shifted to the backdrop: painting the hand green in this iteration drew out an unfortunate association with the Incredible Hulk. On the reverse side I emphasised the dynamism of the event by using the placement of the images to echo the angles of the coloured fields on the other side. Photos are courtesy of Sagaravajra, who deserves a mention not only for his excellent photography but for his beautiful forest garden project in Devon, England. This project was influenced by Shepard Fairey, mainly in the use of colour. I continue to find his work inspiring, especially in the way he leans more towards Art Deco. The typeface is Helvetica Neue. I opted to work in all-lowercase, because I prefer the word shapes: capitals can be obtrusive. There’s a subversive element of giving that layer of formality the finger, whilst otherwise being very structured. Although not myself a devotee of Green Tara, this was the second time in the Spring of 2016 she appeared in one of my projects: see Green Tara, Astronaut, for the Triratna International Gathering. 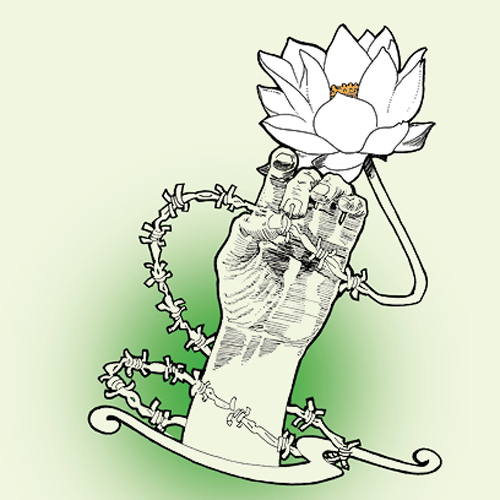 Hand drawn illustration based on a traditional gesture manifested by Green Tara. This project demonstrates the application of Typography Adobe Photoshop, Adobe InDesign, Drawing, and Typographic grid. Follow the links to see more projects using these skills.